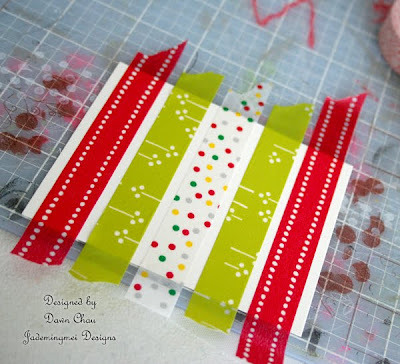 So if you've been on the FB page you know I've been drooling over this fun new product(Washi Tape) I've been experimenting with. Now, I will tell you, it really is not a new trend or fad, as a matter of fact I remember seeing this as a kid when I lived in Hawaii(some 20 years ago). In Hawaii this tape is known by Kawaii Tape. It's essentially the same thing, thin rice paper tape, but the Kawaii versions have cartoon characters like Hello Kitty etc. 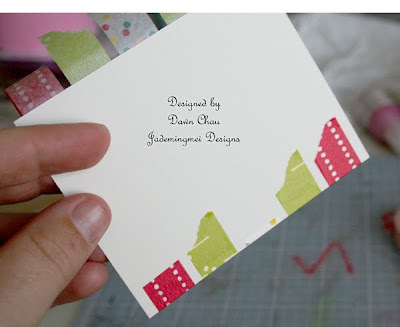 There are lots of places to buy Washi Tape and the collection I'm sharing with you today is from Etsy. Today's post is going to focus on the Christmas stack on the left. Let's get started! I decided to make my own background pattern so I used my CM self healing mat to keep my line positions straight. The tape is not super sticky, so if you need to reposition, just don't press down hard your first try...don't ask me how I know that! 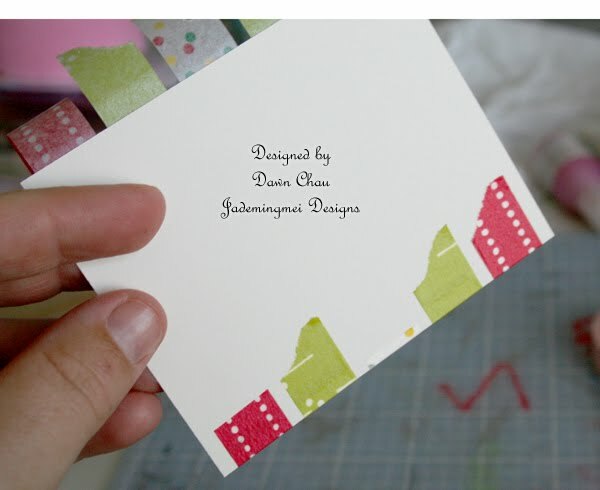 Next, you can trim off the excess if you'd like, but I chose to simply tuck behind onto the backside of the card stock. I mixed two patterns for two separate cards. Voila! See how pretty your background comes out? I didn't want to cover up too much of the pretty tape(Washi Tape is fun to play with, but it doesn't come cheap! 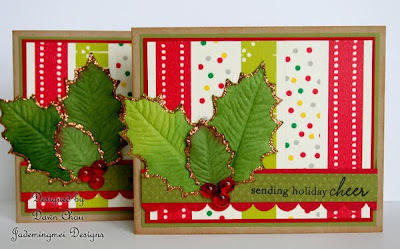 ), so a few textured 'holly' leaves and some red Dew Drops finished my focal image. I was needing a little more depth and texture to my leaves so I traced around the edges with my Copper Stickles. 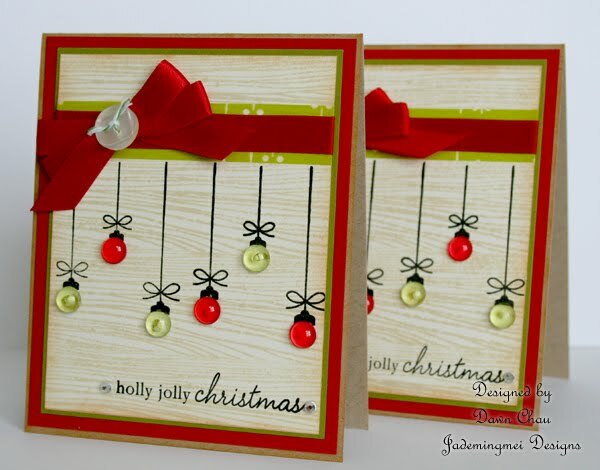 On these cards I only used 1 green strip of Washi Tape(underneath the red ribbon) as an accent. The stamp set is Holiday Button Bits. 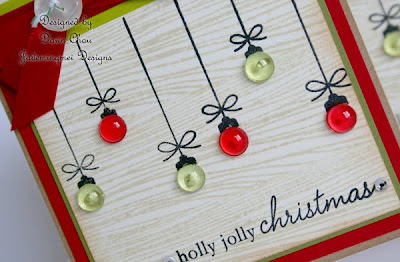 My cards are on a smaller scale than A2, so I chose to substitute buttons with Dew Drops...sparkly! 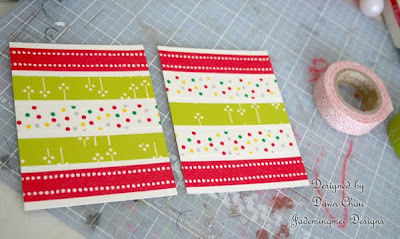 Next post will share some more Washi Tape designs with some yummy gingerbread! 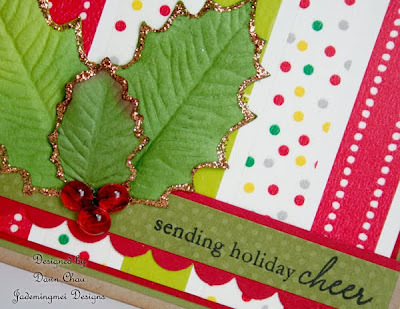 Although I've used this tape for holiday cards, I'm almost certain the tape would also make fun monogrammed cards?! ;) I just might have to play with some of those too! Mmmm! I love Washi Tape and your cards are wonderful!! !